TurningPoint desktop is free and available for Windows or Mac . Users of any other connected devices can take advantage of our new TurningPoint web option to poll directly from a web browser. 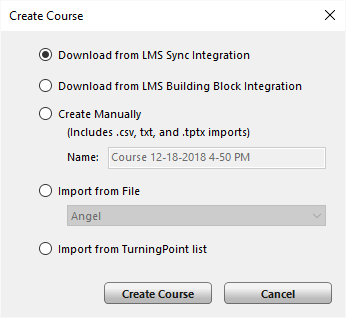 Syncing your LMS Course List with TurningPoint keeps your course list up to date and makes it quick and easy to upload grades. Select your LMS from the list below for specific instructions. IMPORTANT: Downloading a course from Instructor Account is only available if your university utilizes the Brightspace Sync integration. If you don’t see these options, request school-specific instructions. 1. Open TurningPoint and sign in to your account. 3. Click the Course drop-down menu and select New. The Create Course window opens. 4. Select the Download from Instructor Account radio button and click Create Course. The Connect to Instructor Account window opens. 5. Select Click Here to be directed to Instructor Account. 6. Click Connect on the Available Courses you want to add to TurningPoint.The course will now appear under Current Courses. You may be asked to re-authenticate by signing in to your LMS. 7. Return to TurningPoint and select Refresh to download the course(s). Current courses will now be visible in the left pane. Your courses are updated upon login. You can also update and upload grades from within the course overview screen. 8. Download and provide students with registration instructions. IMPORTANT: Downloading a course from Instructor Account is only available if your university utilizes the Blackboard Sync integration. If you don’t see these options, request school-specific instructions. 6. Click Connect on the Available Courses you want to add to TurningPoint.The course will now appear under Current Courses. You may be asked to re- authenticate by signing in to your LMS. Your courses are updated upon log in. You can also update and upload grades from within the course overview screen. IMPORTANT: Downloading a course from Instructor Account is only available if your university utilizes the Canvas Sync integration. If you don’t see these options, request school-specific instructions. IMPORTANT: Downloading a course from your LMS is only available if your university utilizes the Moodle integration. If you don’t see these options, request school-specific instructions. Click the Course drop-down menu and select New. The Create Course window opens. Select the Download from LMS radio button and click Create List. The Connect to Integration window opens. Select the appropriate Integration from the Integration drop-down menu. Enter the Server Address, Username and Password in the appropriate fields. Optionally, click Remember this information to have the Integration, Server Address and User Name stored for future use. If applicable, select the Institution from the Select an Institution drop-down menu. The Import Course window opens. Select the course or courses to import. Optionally, select the Select All checkbox to import all courses. A confirmation box is displayed. The course is added to the left panel of the Course Overview screen. Select the course to view the participant information. TIPThe imported course contains the following information: Device ID(s), Subscription Status, First Name, Last Name, User ID and Email. 13. Download and provide students with registration instructions. IMPORTANT: Downloading a course from your LMS is only available if your university utilizes the Sakai integration. If you don’t see these options, request school-specific instructions. 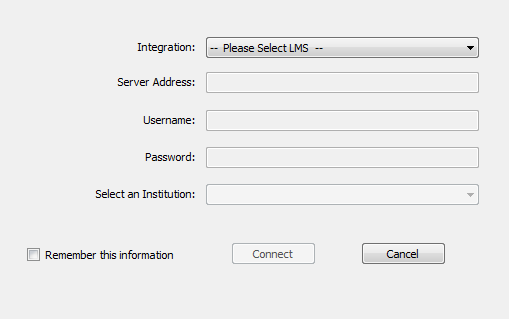 Select the Sakai SSO option from the Integration drop-down menu and enter the Server Address in the box provided. Enter your Sakai Username and Password and click Log In. If the window does not close, click Finalize Connection. Go to instructor.turningtechnologies.com and Sign In to your account. Under the Current Courses section, locate the Manual Course card. Enter course name in the field provided. Click Create. The course is added to Current Courses. Return to TurningPoint and select Refresh to download the course(s). Current courses will now be visible in the left pane. This option is only available within a manual course. Locate the desired course and click . The course opens on the Roster page. Click on the top right of the page. Enter a valid email in the text box provided. You must separate individual emails with tab, commas, or enter/return. You may also paste from applications like Excel or a CSV. Click Invite. The students will receive an email invite to join your course. IMPORTANT: Downloading a course from an LMS is only available if your university utilizes a TurningPoint integration. If you are unsure or don’t see these options, request school-specific instructions. The PowerPoint Polling training class is designed to get you up and running using the direct integration with PowerPoint. By the end of the training, users can expect to fully understand the PowerPoint Polling application and begin using it immediately. After creating your content, download an in-class guide PDF for presenting or dive deeper into TurningPoint and learning theories with additional instructor resources.